Whatever Your Timeline – We’ve Got Your Malta Itinerary. Eric visited in 2016 with two friends and explored basically the entire country just on day trips using the buses. Fun story for another time: Eric almost missed the flight there. You know when you see “the runner in the airport”? That was him – thanks to trusting a friend with the departure time. However, the Story of “Sprinting Through Edinburgh Airport” is a tale for another day. Discover Malta: Sightseeing on Malta, what to see in Valletta, and best places to stay in Malta. Discover Gozo: Things to do and see on Gozo and where to stay on Gozo. So, whether you’re looking for a weekend break in Malta or planning on staying in Malta for 5 days, 7 days, or for much longer, there are lots of cheap holidays to be had in Malta if you know where to look and how to plan. You can even piece one together yourself! Here’s our guide to help you piece together your perfect Malta itinerary. Before we dive in, the country of Malta is actually comprised of three islands: the main island of Malta which is the largest, the smaller island of Gozo in the northwest which you must take the ferry to reach, and the smallest island of Comino in between Malta and Gozo (also only accessible by boat). Corresponding with the post below, here is a map of the different areas/towns we mention (blue stars), attractions/sights visited (red walking person), accommodations recommended (purple sleeping people), beaches mentioned (yellow swimmer), and restaurant visited (green noodle bowl). Hopefully that’s helpful! 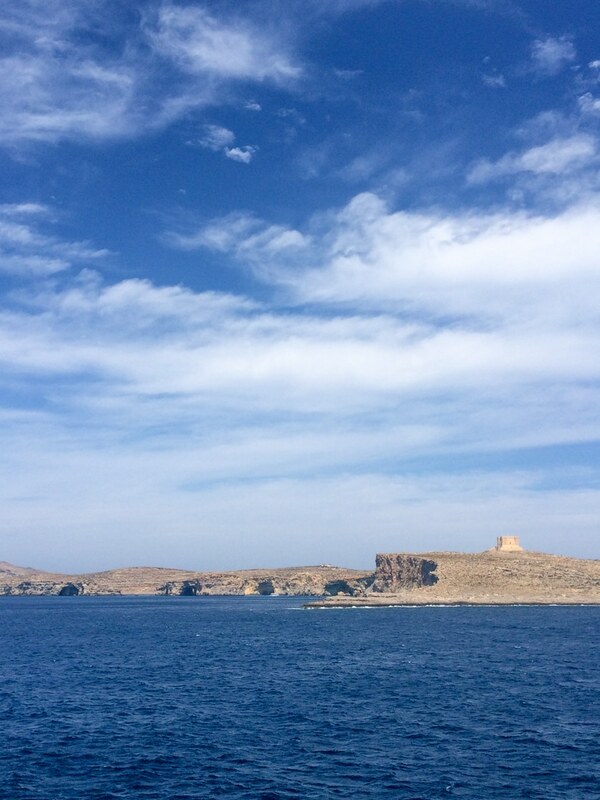 Driving a car – you can travel from the southernmost tip of the main island to where the ferry heads to Gozo in the northwest in about one hour. That’s the entire length of the main island. One hour. That said, it makes getting around the island very easy. Many places and sights can be done in a half-day or even a day trip from where you are based. With a lot of things accessible from the towns which are the “centres”, you can easily walk to sights and attractions if you’re in Valletta or Sliema. Walking around that entire area will allow you to see all of the capital and where the busiest parts of Malta generally are if you don’t have a ton of time. If you’re confident driving and you’re sticking around for more than a few days, renting a car is by far the easiest way to get around on your own schedule. Malta Driving Tip: they drive on the left like in the UK. However, driving is something you’ll have to seriously consider for you and your skill set as a driver in Malta – as with any other foreign destination. The upside to a car is that often buses run the major routes but leave you to walk to any hidden gems (swimming spots, vantage points, smaller towns). A car allows you to get to exactly where you want to go and park very close by. The downside is that culturally, driving in Malta is said to be quite intimidating. This is due to a more aggressive driving mentality, higher speeds outside the cities that can result in sporadic braking, and a lack of patience during rush hour. It’s advised to have full insurance on a car rental. If you’re just staying for under 2/3 days and only in Valletta or Sliema, then you won’t need a car as you can walk everywhere or take a cab. You’ll get to the from the airport at a flat rate for taxi and that will be all your car needs covered for that kind of visit. See below for taxi/private car. Rentals can be picked up very easily at the airport but you can check out the Malta International Airport website for more information on car rental. If you want to rent a car in Malta, you can compare the rental car prices across companies in Malta here! Ah, the bus in Malta. If you’ve been before, you’re probably laughing as well. If you haven’t been – know that the bus is a great, cheap way to experience the entire island. BUT – it’s an experience, to say the least. What we mean is – they are new buses and totally safe – but often you’ll be amazed at the speed and tight turns these drivers make and somehow NOT get into accidents. If you’re sitting, you’re fine. If you’re standing with all the other locals and tourists heading for the beach, hold on tight! The other aspect of the buses worth mentioning is a more cultural thing about Malta. “Malta time” is a relaxed pace and your bus will not be on time. This is obviously route dependent – but in our experience not a single bus came when it was posted on the schedule. But they always DO come either 10 minutes before or 15 minutes late. Our rule of thumb was head for the bus stop 15 minutes before you want to leave and then just get on the one shows up next. In short, if you can be relaxed with your times and itineraries, then the bus is a great option. There’s the official website of Malta Transportation – they offer a variety of passes for various trip lengths and usages. The official white taxis can be found around the island. Since there’s been criticism of overcharging, these cabs are required to use the meter in the taxi to calculate your fare. If you grab a cab at the airport, there all operate on a flat fee to certain popular destinations like Valletta, Bugibba, Sliema, and to where the ferry can take you to Gozo. You can learn more about those flat fees here. There are also unofficial taxi services, or private hire “black cars” that can be cheaper than the official taxis and arranged through a call or through a hotel reception. Generally these services are useful if you’ve got more than one traveller and you have more than one bag heading a longer distance across Malta than just from the airport to Valletta. You can check out eCabs as a good example of this kind of service. If you’re planning your Malta itinerary, you’re going to need a place to sleep. While this article is focused more on “what to see and do in Malta”, we have written a VERY in-depth guide on the best places to stay in Malta (just the main island in this post) – including cities and suggested accommodations. That said, the suggested itineraries below also include a few suggestions in the cities/towns so that some of the hotel searching is done for you! We also wrote a whole detailed accommodation guide on where to stay on Gozo. Apparently, no one had covered it yet in-depth and Gozo is such a good option for a hotel, apartment, or farmhouse villa. A few nights on Gozo is recommended since there’s loads to see and it can be far less busy than the main island of Malta. If you are looking for a hotel in Malta, then you can check for the latest deals in the most popular areas. While many choose to stay in Valletta or Sliema, there are lots of great coastal areas with developed waterfront properties for you to discover. We cover those below as well! If you need a hostel, they can be much cheaper than a hotel and still provide a clean, fun, and/or boutique experience – depending on your style! Check out the availability of Malta hostels on Hostelworld. There aren’t a ton of hostels in Malta to begin with. Many of them are concentrated in Sliema and St. Julian’s with one located on Gozo. We talk about a handful of them in the sections below should you need to book anything! Since we’re talking about the entire country, there is LOTS to keep you busy in Malta. If you’re going because you’re a sun chaser that’s totally fine. If you’re going with the intention to adventure around the island, then there is plenty for you to do and see. What you actually end up doing will dictate the areas you spend the most time in and vice versa. If you want to explore the history and the old towns then walking tours and the cities might be more for you. If you want to swim, dive, or explore more of the “water” side of Malta, then the coastal areas will be for you. If you want both – that’s doable, too! To help you trip plan, we’ve also included a few activities that we did below in each of the sections, but you can also browse the top tours and attractions before you go to avoid disappointment. The summer season can get busy and the best activities or tours DO honestly get booked up. 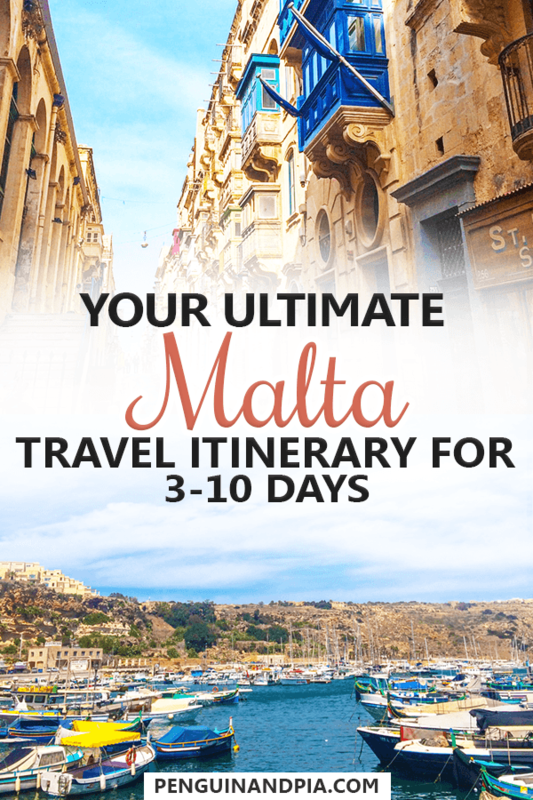 Since people seem to be passing through Malta on the way to someplace else or they have found a cheap flight in and out and are just going for a short trip, there’s a need for a quick “3 day Malta itinerary”. 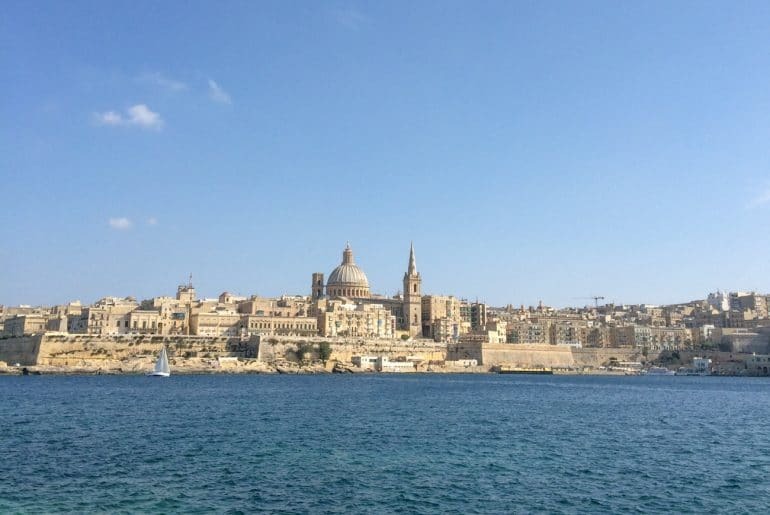 Of course, to get the best bang for your buck and see the most that you can – it’s wise to stay in the capital of Valletta, or close by in Sliema or St. Julian’s. You’ll be able to see the most “stuff” by simply walking around. From those places, you will be well connected by buses to make a day trip or two to see other sites before you leave. We will get into what these sites might be down below. 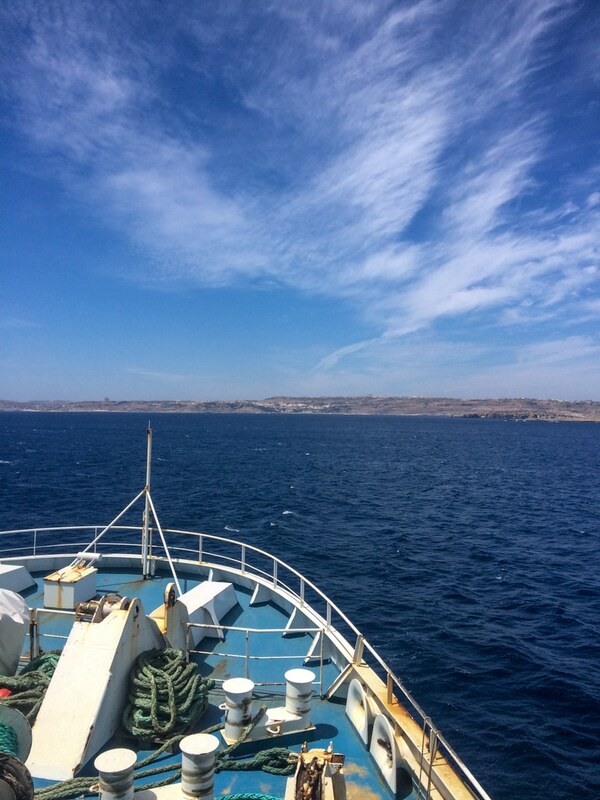 Day 2: A day trip to Gozo and back. Day 3: A half day trip to Golden Bay or Mdina + fly home. If the beach doesn’t interest you, then skip Golden Bay and head for the medieval city of Mdina. We’ll cover each of the above places with a little more detail and tell you what you can see and do if you do head there! Let’s start with the capital of Malta, beautiful Valletta. You know how people sometimes describe a place by saying, “it’s like stepping into a time capsule and going back in time”? Well, that’s Valletta. You walk through the city’s main gate and into the walled fortress of a city and it is like time froze. The further you go towards the end (where you’ll find St. Elmo’s Fort) the quieter and older the place becomes. The shutters are all coloured brightly. 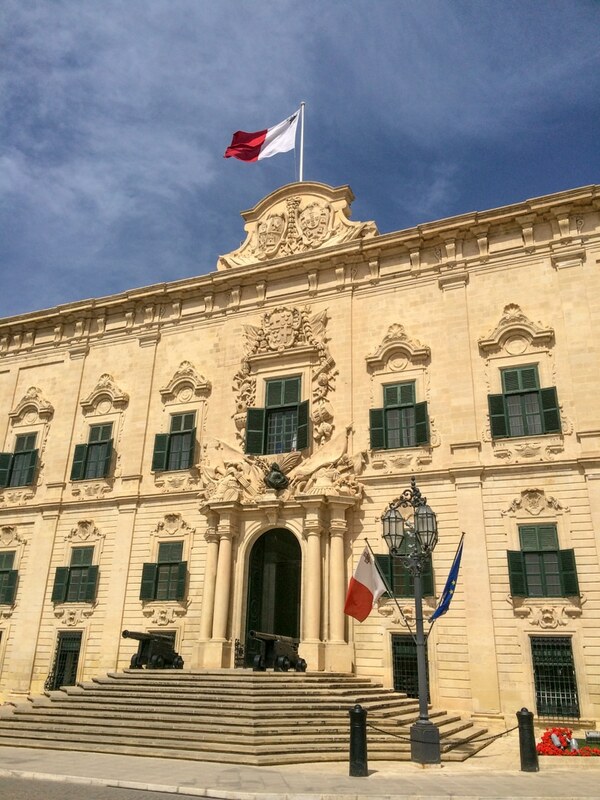 There’s so much to do and see in Valletta we wouldn’t even try to name anything. For the smallest European capital, you might feel overwhelmed! Most of the streets in Valletta look like this! 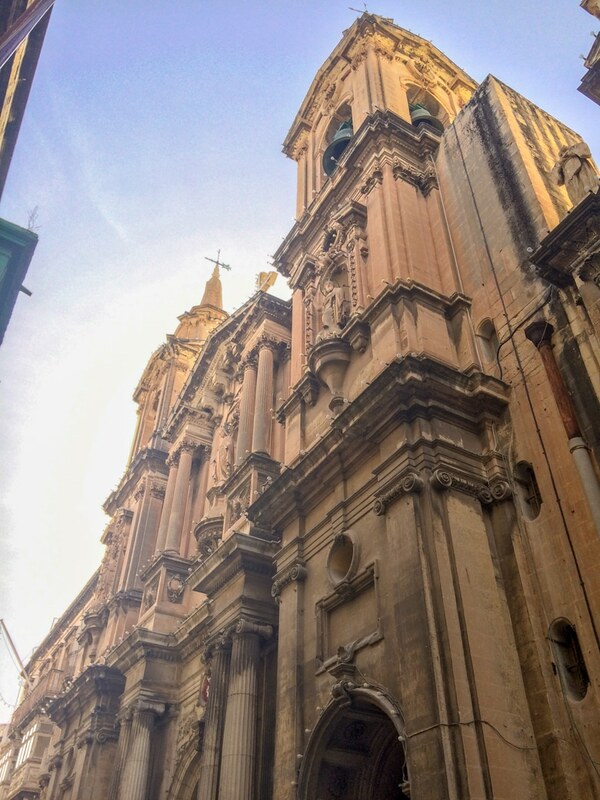 Saint John’s Co-Cathedral is just one of the many churches and/or basilicas in Valletta. There’s many little shops and cafes to stop in for a snack or a coffee. When you first enter the city, you’ll find the Upper Barrakka Gardens overlooking the Grand Harbour towards the Three Cities. We were lucky enough to catch the firing of the cannons which was a spectacle to see! Being war history buffs, we visited St. Elmo’s Fort which we thought to be well worth the money. Another cool find near the Barrakka Gardens was the Lascaris War Rooms – a museum comprised of the underground rooms and tunnels used for defensive strategy in World War II. From the Upper Barrakka Gardens looking over the Grand Harbour. From the Upper Gardens looking out to sea. 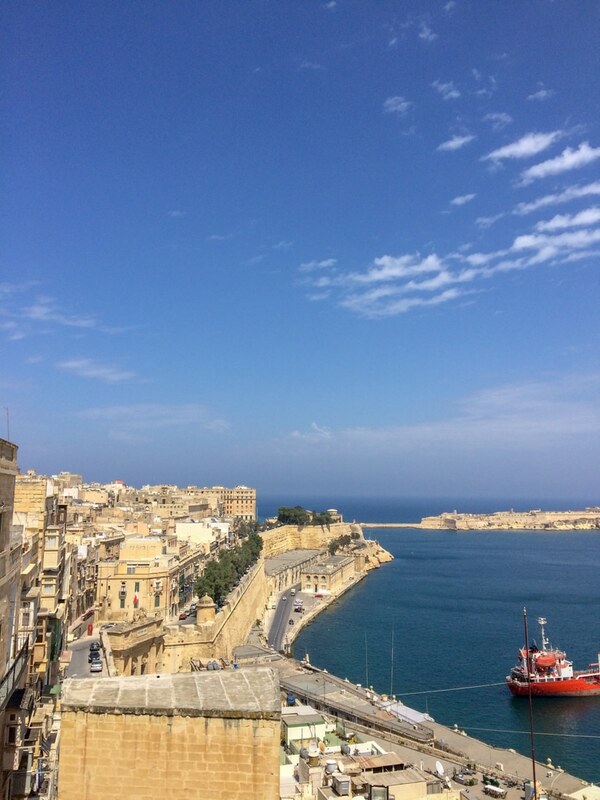 There are lots of hotels to choose from in Valletta so to get you started here are some that are well-rated and regarded as being the best value for money on Booking.com – The British Hotel and the Grand Harbour Hotel. 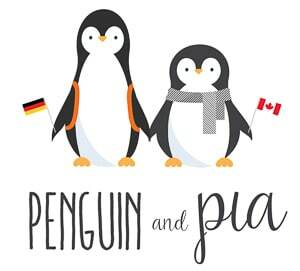 You can check out their availability by clicking the links. 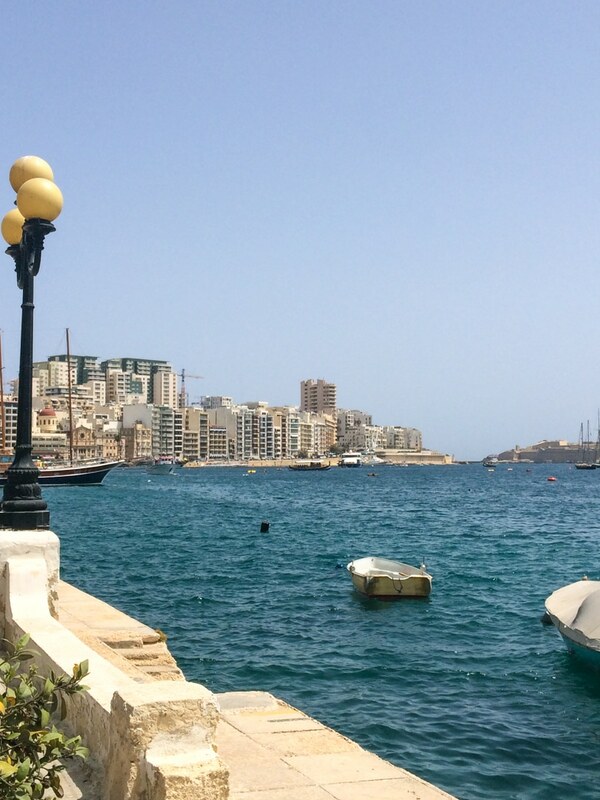 Sliema is popular among people visiting Malta for a reason. It’s beautiful, it’s not the centre of Valletta (which can get busy), and you have everything you need. Most importantly, you can walk the boardwalk for ages and ages discovering new places and restaurants along the way. 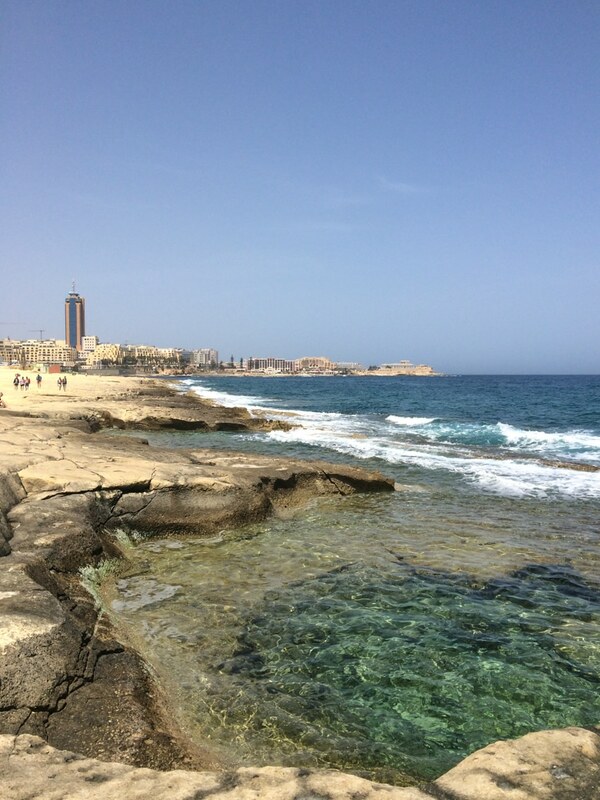 Most of the shore is lined with large flat rock and technically this is the Sliema Beach – where you just bring a towel and sunbathe like a local. It’s very, very peaceful – and there are attractions like the Torri ta’ San Ġiljan (a historical watch tower that you can go up and in). It’s also important to note that the road along the sea is the major bus route so getting anywhere from Sliema is very easy. As you walk towards St.Julian’s, the scene will get livelier. The bars and restaurants increase in frequency as you near Spinola Bay and the further you go you’ll be in the famous St. Julian’s which has all the best clubs and bars in one area. There’s a lot of activity in St. Julian’s from the casinos to the massive hotels and resorts that line the water. Sliema Beach looking towards St. Julian’s and the Portomaso Casino. Sliema with Valletta just to the right. 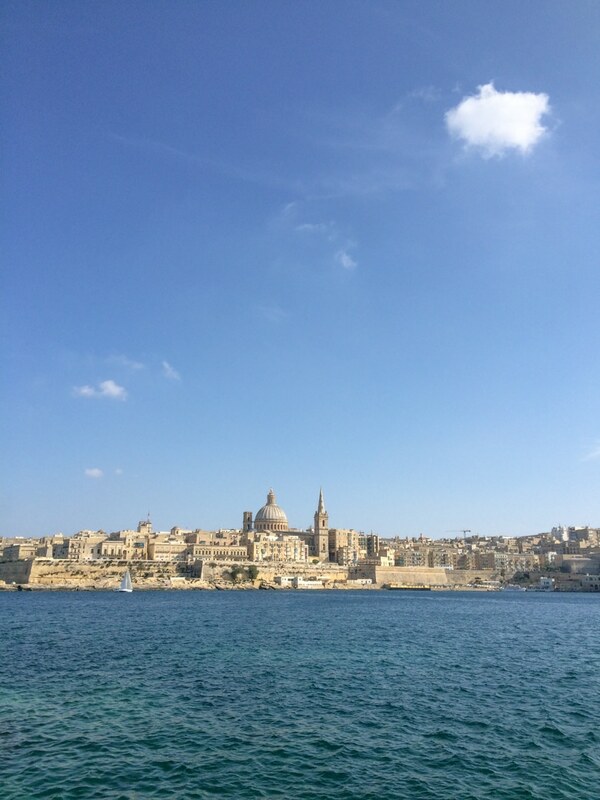 Malta Tip: Take the ferry from Sliema to Valletta and back. They run every 30 minutes (from one of the sides) in the summer and it takes about 10 minutes to cross with a nice view of the neighbourhoods from the water. It’s only 2.80 euro for an adult return ticket. Here’s the link to check out the Valletta-Sliema ferry website. Fun Story: Once, Eric and his buddies walked from Sliema to Valletta because it didn’t look that far. Well, in the heat – it is far. Deceivingly far given that the shoreline weaves in and out along the coast through Msida and Gzira making the trek that much longer to actually get around the harbour. Hours later, we had made it to Valletta. It’s possible – and it’s nice to explore those areas in between to photograph the beautiful fishing boats and whatnot. It will just take a while. You’ve been warned! As mentioned, these are the two areas where you will find basically all of the hostels located in Malta. Doing it all again, we’d try to book a stay at Hostel Jones in Sliema which is highly rated and a great place to stay according to other travellers we had met. An even nicer hostel in Sliema is the Two Pillows Boutique Hostel. If you’re interested in staying in St. Julian’s where all the nightlife is, then consider booking Marco Polo – a very popular hostel. Finally, you can check out details for Inhawi Hostel in St. Julian’s. Overall, lots of these hostels have great reviews so have a read and see if any of them work for you! As for hotels, if you want to stay in Sliema one of the nicest places is Blanc Boutique Guest House. Guests are treated to the location of Sliema with the comforts that you should have on a vacation. If you’re keen to stay a little bit closer to the action in St. Julian’s, then perhaps check out St. Julian’s Bay Hotel! 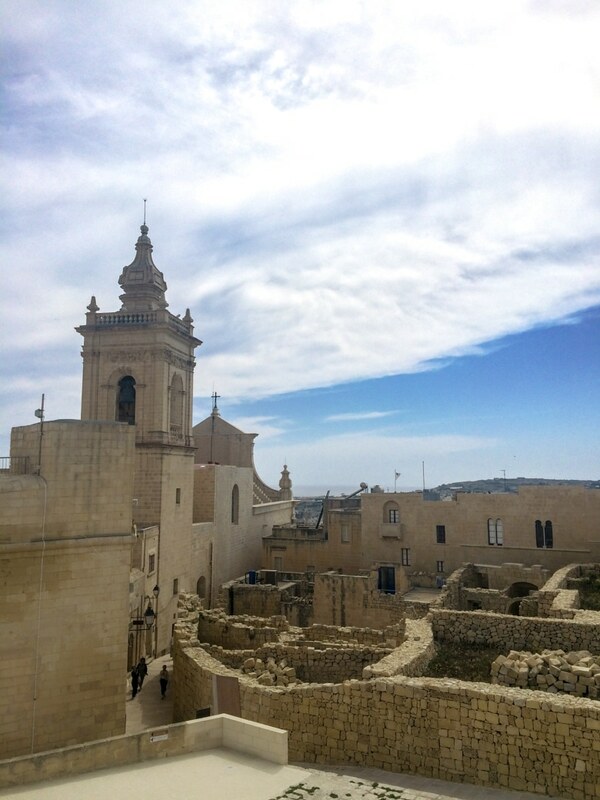 Mdina, close to Rabat (it’s technically the same town/area) has plenty of things to do. This is why a day trip out there could easily be worth your time. Of course, there’s the actual walled medieval town of Mdina. As the former capital of Malta way back when, there’s history around every corner. From up high on the walls, you can get a great view of the surrounding area. There’s a great attraction/museum at St. Paul’s Catacombs – the largest Roman underground cemetery in Malta. We checked them out and it was great to learn about the Roman influence and the history of Malta, in general. The tunnels and underground caverns aren’t for everyone, though! Tickets can be purchased onsite but click the above link to learn more. Another thing you can do from Mdina is to hop on another bus and head out to explore the Dingli Cliffs – the highest point above sea level in Malta! You’ll get stunning views and photos at sunset. You can take the 52 from Mdina to Dingli and walk another 10 minutes or the 201 makes its rounds right by the road on the cliff edge. You can see the details below! If you plan on spending a night in Mdina then consider staying within the medieval walls of Mdina. To do that, book a stay at The Xara Palace Relais & Chateaux or check out the beautiful Point de Vue in nearby Rabat. Walking the narrow streets of Mdina is really silent and beautiful. The view from the top of the fortified walls in Mdina. 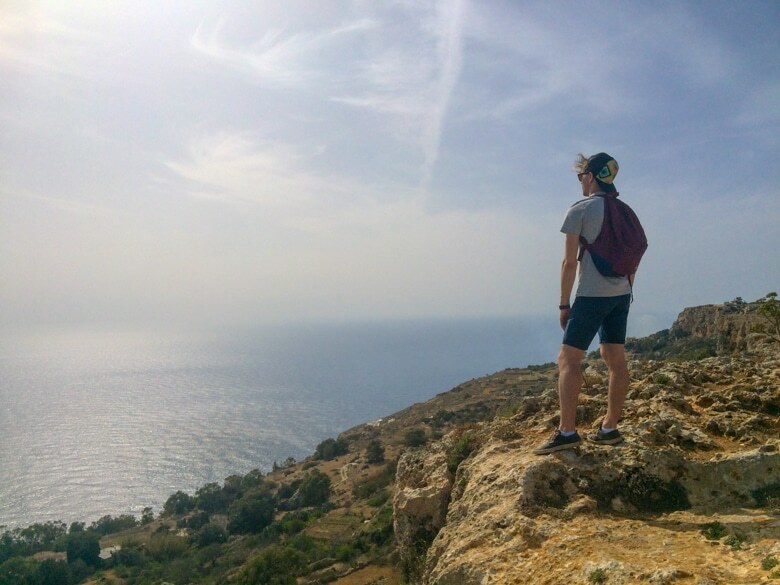 Eric taking in the view from up on The Dingli Cliffs. You’ll get to the Dingli Cliffs by taking the bus from Mdina. While there’s not a ton to do when you actually get there – there’s a few places to grab a drink or food. Naturally, you walk along the paths and admire the views from 253 metres above sea level. As mentioned, this is actually the highest point in Malta! The area is a go-to spot for sunsets. The beach overlooking Golden Bay with Għajn Tuffieħa Tower saying hello! The beach at Golden Bay was simple to get to by bus as the area is well developed with its own hotel and resort nearby. The beach is very popular so it can get a bit busy but it is easy to see why: the sand is golden, the water is clear, and the shore drops off quickly so that you can swim without going too far from the beach. The beach itself is Blue Flag Certified meaning there’s a high level of safety and amenities available. You can read more about the beach here. If you’re heading to Malta for three days or less, then often Gozo and Comino get cut from the itinerary simply because there is just so much to see in the cities/areas surrounding Valletta on the main island. Understandably so. A traveller passing through might not want to navigate the ferry and the bus/taxi once you’re there to get to the capital of Gozo, called Victoria. We would argue otherwise. 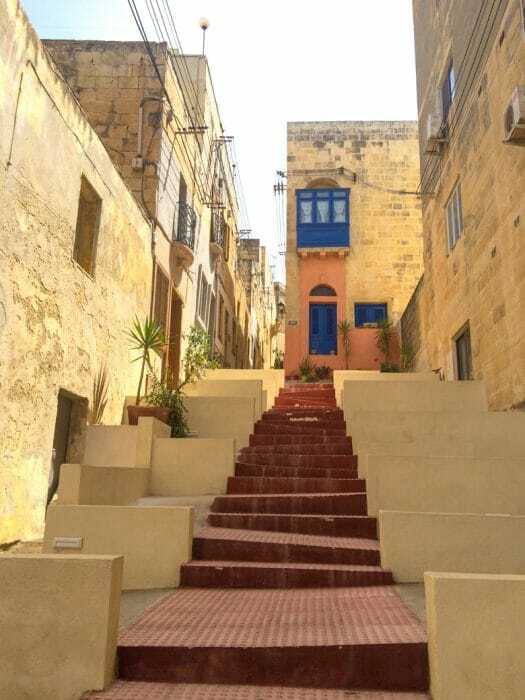 While in Malta for a few days, it became a must-do for us and we’d argue that one whole day could be committed to seeing Gozo since there are many attractions on the island (which you can read about below). For now, here is the website for the ferry that leaves from Cirkewwa to Mgarr on Gozo. The ferry to take you over. It’s a gorgeous ride across the sea. St. Mary’s Tower on the island of Comino. The Island of Comino has St. Mary’s Tower and is very, very small. You’ll find some of the most popular sites for swimming and diving called the Crystal Lagoon and the Blue Lagoon. These beautiful public swimming spots can be a trek to get to but it’s worth the tranquility as many of the tourists stay to the main bus routes and beaches accessible on Malta or Gozo. The ferry system to Comino is slightly different than the line from Malta to Gozo and operates on seasonal need with reduced runs in the winter but more frequent runs in the summer months. You can read more about the schedules and prices of the Comino ferries here. As mentioned above, there are many things to see on the Island of Gozo. If you start in the capital of Victoria, you’ll be treated to the Citadel and the Gozo Cathedral. You can learn more about the main attraction here but the Citadel is beautiful and definitely worth seeing. Another highlight on Gozo if you’re interested in the history of the island (and civilization in general) is the Ggantija Temples which are a UNESCO World Heritage Site for being almost 6000 years old. Everything is accessible by buses on Gozo – and the Gozo sightseeing bus is actually a great option for exploring the top sights on the island cheaply and easily! The boats in the Mgarr Harbour. The Citadel in Victoria, Gozo. If you’re going to change your base to Gozo there is only one hostel but it is highly rated. See if you can book a stay at Santa Martha Hostel. As for hotels on Gozo, there are lots that are scattered around the centre and on the coastline. Here are two well-rated ones that are in Ghasri – just outside of Victoria – to get you started. Have a look at Maria’s B&B on Gozo or have a look at Gozo Escapes. The pools look absolutely stunning at both! If you want to be bold and stay on Comino, there is only one place to stay. You have to see the Comino Hotel – but do remember it’s only open in the summer season! It’s not uncommon to stay in Malta for 7 days. In that case, you’ll need a 7 day Malta itinerary. If this is the case for you, then we’d suggest adding on a few day and half-day trips to other areas of the island. 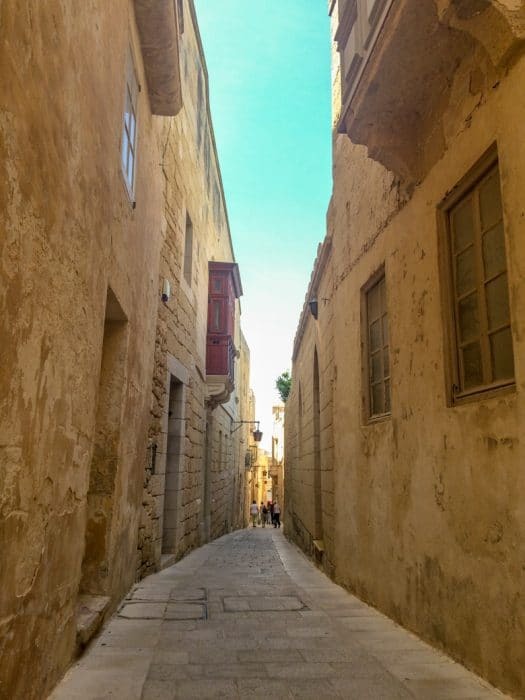 So, to put together your full 7 day itinerary, consider adding on 3 or 4 of the following areas that (along with the surrounding areas) are each meant to fill a day: The Three Cities + Mellieha + Marsaxlokk + Bugibba + Towns like Msida, Gzira, and Manoel Island. 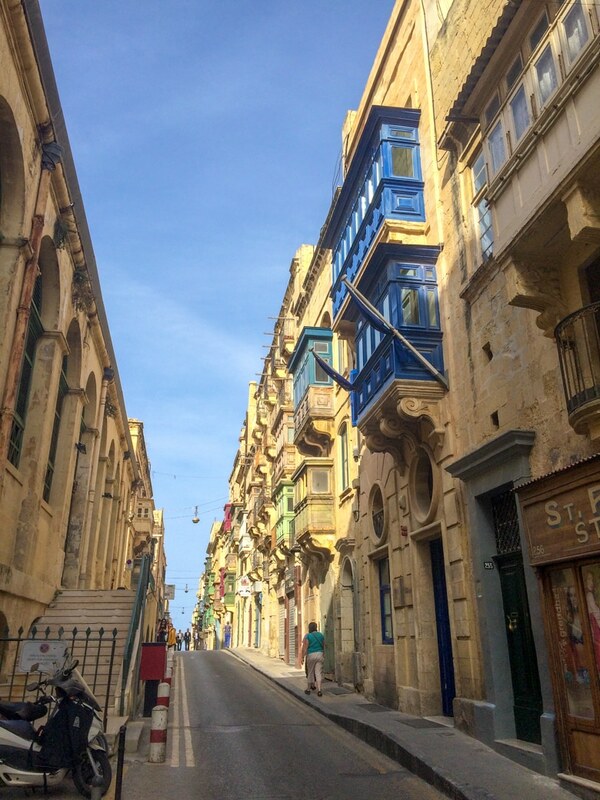 Day 4: Wander The Three Cities and/or Towns like Msida, Gzira, and Manoel Island. Day 7: A half-day in Marsaxlokk + then fly home. We will dive into what each of these places are below. If you read up on these and a few of them don’t work for you and your interests, then consider adding another day in Valletta or on Gozo. 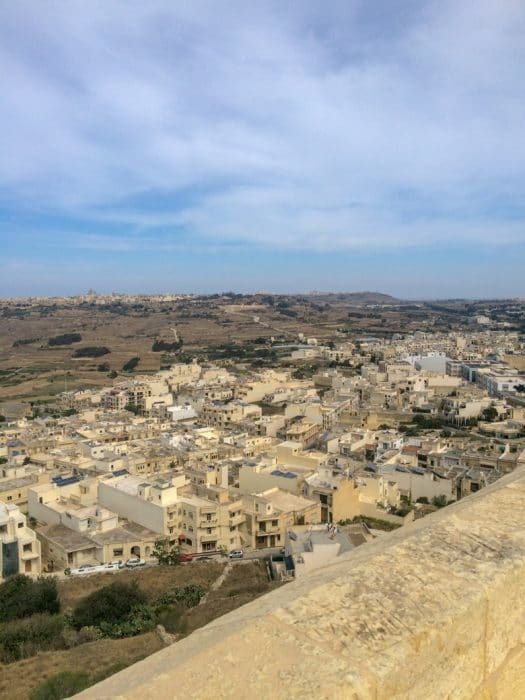 Another option we’d suggest for a 7 day Malta itinerary is that you should switch up your base from Valletta/Sliema to Mdina, Bugibba, Gozo, or Mellieha. By the end of the next section, we’ll have discussed accommodation in all of these places to help you out. It’s difficult to say which location you should stay in after you’ve been in Valletta/Sliema since Mdina, Bugibba, Gozo, or Mellieha are all so different. If we had to choose, we’d go with Mdina since the city is apparently just magical at night! However, if you want to stay on the coast, Bugibba or Mellieha would be the clear choice. Another consideration for a week itinerary is getting around. If you didn’t want to rent a car and you’ve been taking the bus, then you might consider buying one of the discount passes for the week. The transportation website for Malta has a variety of deals and passes for different stays and the ExplorePlus Card seems like it fits the needs for a week traveller. Here’s the website for the breakdowns of the cards. The end of the peninsula on Senglea. Fort Angelo from the Harbour. 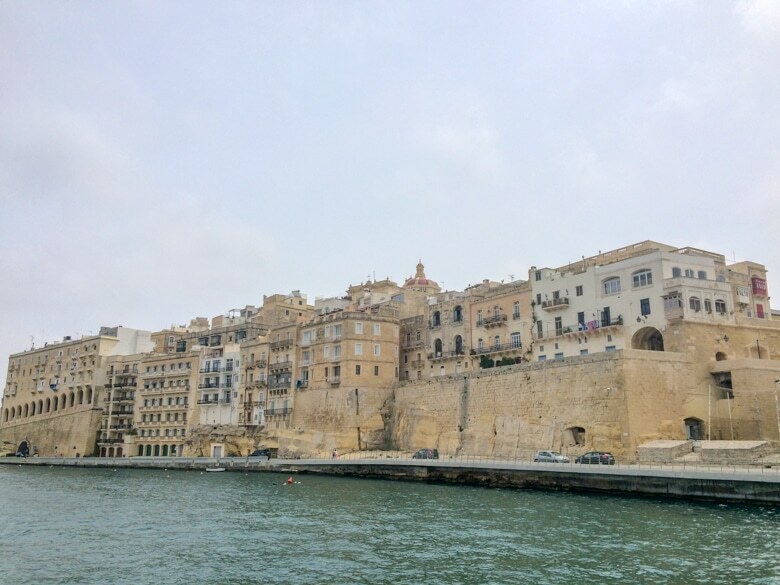 The biggest addition or substitution to the original three day itinerary is probably that we didn’t include checking out “The Three Cities” of Birgu, Senglea and Cospicua. 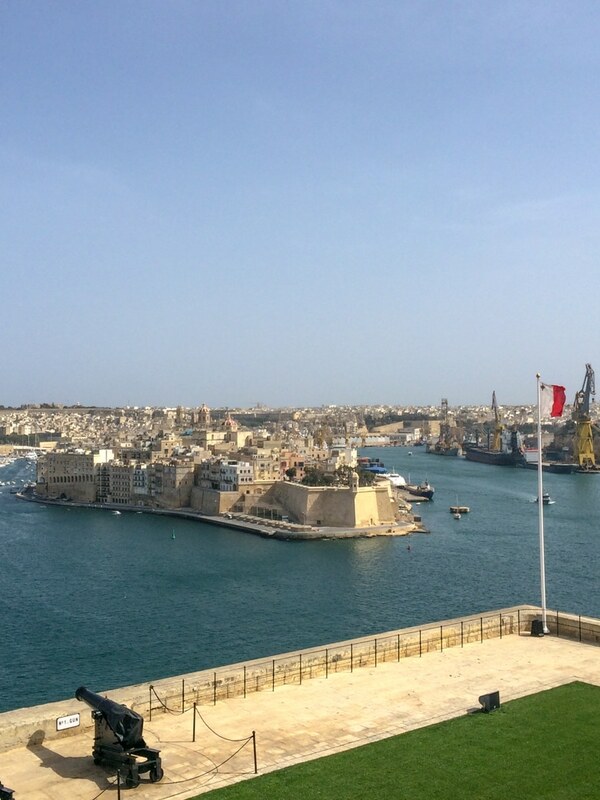 The cities are actually peninsulas that shoot out into the Grand Harbour across from Valletta. At the tip of Birgu, you’ll find Fort St. Angelo – a very popular medieval fort that’s been restored and offers amazing views of the Grand Harbour. Mellieha is located in the north end of the main island of Malta. 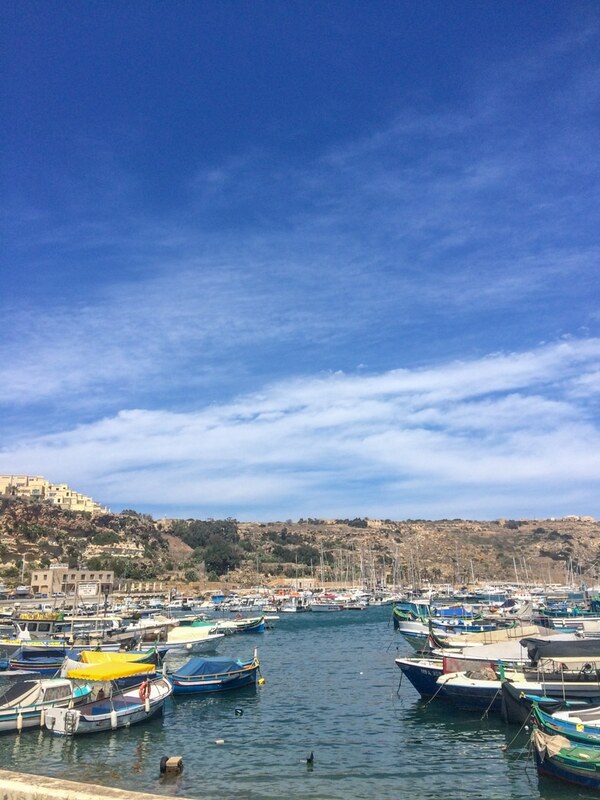 Mellieha, or more specifically Cirkewwa, is the town where you catch the ferry to Gozo. Mellieha is an area and also the name of a physical bay that you can stay close to and swim in. The beach is fittingly called Mellieha Bay. In the area, there’s a few things you can hop on the bus or drive to go see. 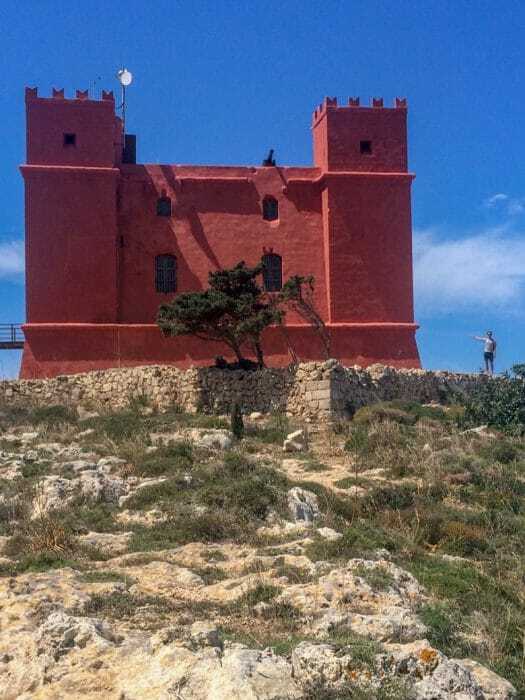 One of the coolest and unique things is St. Agatha’s Tower which is also called “The Red Tower”. Perched high up on the hill, this stone tower built in 1649 was used by the Knights of St. John and in World War II. We made the trip and aside from the amazing views of the area, there’s a nice little historical display/museum inside about the rich history of Malta. You’ll have to get off the bus in what feels like the middle of nowhere and walk up the hill but it’s worth it! You can read more about The Red Tower here. A night in Mellieha could be perfect with a stay at the Ramla Bay Resort. Located right on Ramla Bay, the resort offers stunning views of the sea. Check for availability at Ramla Bay Resort. 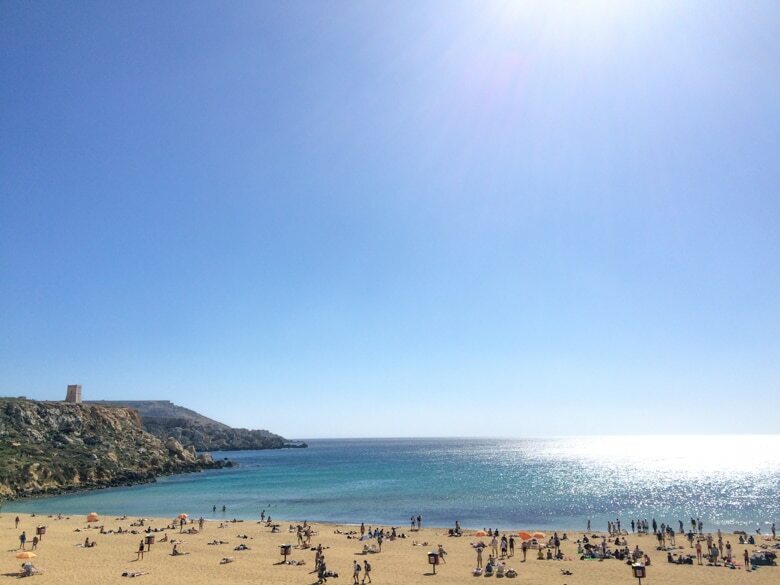 If you’re keen to stay right on Mellieha Bay, look no further than Mellieha Bay Hotel which is right on the beach! Marsaxlokk is one of the most famous/popular things to see in Malta that we didn’t get a chance to see. Marsaxlokk itself is a small fishing village located on the southeast tip of Malta, southeast from Valletta. The area is beautiful with traditional fishing boats lining the harbour. The thing to experience is the Sunday Fish Market. Fish is sold in the markets all days of the week but on Sundays, the daily catch are taken from the boats and sold right there on the shore in the market. The market itself has grown and developed from the days of just fish trading to including other shops and stalls that sell local honey, jam, fruits, and otherwise. The scene has also developed to have a variety of places to grab a bite to eat and a drink looking out over the sea. The restaurants all specialize in seafood so if you’re a seafood lover (Eric is) then head to Marsaxlokk. The fact that the seafood is fresh makes Eric even sadder they didn’t visit last time! Bugibba is s small resort town located in the northeast of the main island. The area is known to be a tourist hotspot because of the abundance of hotels and resorts that line the northern coast of Malta near the popular St. Paul’s Bay area. There are lots of restaurants and bars in the area as well as many local beaches that can be walked to or reached by car or the buses. It’s one of the “centres” that’s not Valletta so it’s well connected to other attractions and historical landmarks in the area. You can learn more about Bugibba here. If you’re considering staying in Bugibba, then consider booking The Village Apartments which is located right in the centre of town. Staying right on the water is easy at Seashells Resort or Il Palazzin – both of which are right on St. Paul’s Bay! Tucked away between Sliema and Valletta are some smaller towns that each have their own charm on the waterfront. If you take the bus from Valletta to Sliema, or vice versa, you’ll pass through these places without a second thought. Luckily, because we accidentally walked to Valletta we got to walk the shore and discover them for ourselves. Extending from Gzira is a small island that’s mainly for boat docking. 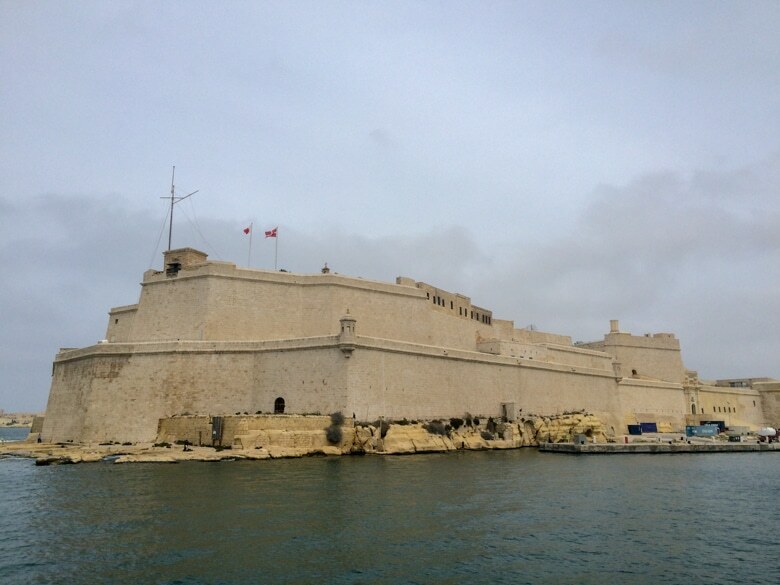 Nonetheless, Manoel Island has a Fort at the tip of it called Fort Manoel. Cool to photograph, but it’s been open and closed in recent years due to renovations so check before you make a point of seeing it. One amazing food recommendation in Gzira is to go to Good Thaimes Pub. From the outside you might miss it but inside you’ll find some of the best Thai dishes in the area. With a decent beer list and a very chilled atmosphere, many good times were had at Good Thaimes (see what we did there?) since Eric’s buddy worked there. Good food, good drinks. Simple. St. Agatha’s Tower – Eric for Scale. Beautiful accessible ramp and stairs on the way to Valletta. If you were planning on staying in Malta for more than 7 days, then we would definitely recommend changing bases once if not twice to shake up your experience. As we mentioned above, being based in Valletta or Sliema is nice, but returning to these places each evening won’t allow you to explore other activities and areas at night because you always have to head back home at the end of the day. So, with that much time available to you we’d recommend changing your sleeping base by adding on a night or two on Gozo since there’s plenty of accommodation (and by plenty we mean a good amount but book ahead to ensure you have a bed in the busy summer season). As we linked to above, there’s even one hotel on Comino that you can stay at. If you then wanted to change sleeping locations for a third time, then stay wherever you haven’t already out of the options: Bugibba, Mdina, Gozo, or Mellieha. All of these “centres” are on the major bus routes and are accessible by car very easily. As we’ve mentioned, Mdina is in the middle of the island while Bugibba is on the coast but both have their styles. 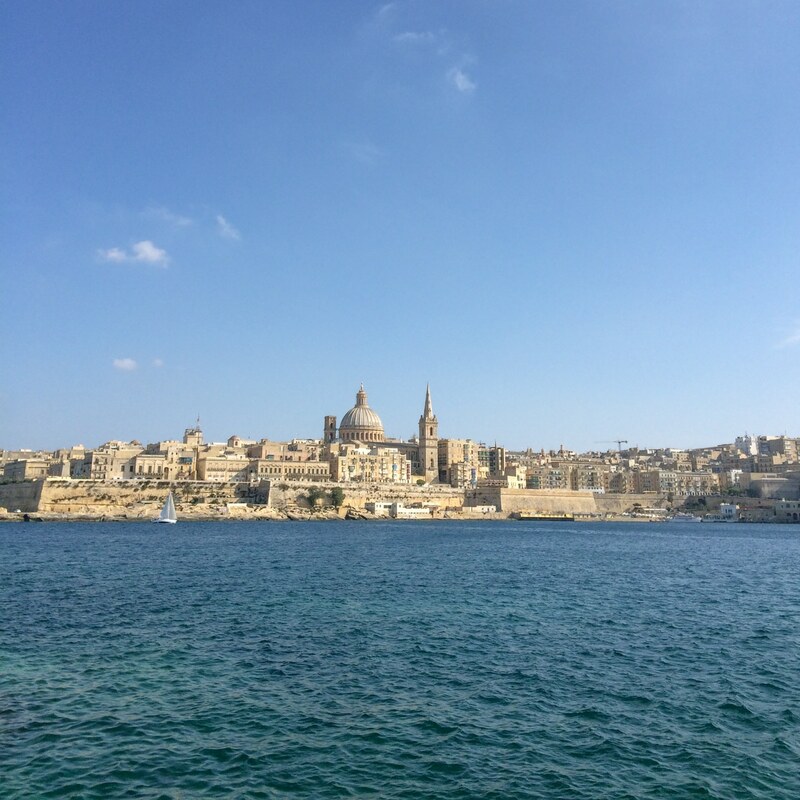 Day 10: See Towns like Msida, Gzira, and Manoel Island + then fly home. If you’ve moved your base to Bugibba, Mdina, or Mellieha which are all in the middle to northern end of Malta (see above map), then you can extend your list of things to do by visiting the beaches in that area very easily. Of note, a few of the other well-known beaches are: Ghajn Tuffieha, which is usually uncrowded but close to Golden Bay, Mellieha Bay which is the longest sandy beach in Malta, or Paradise Bay, which is located very close to where the Gozo ferry leave to make its crossing in Cirkewwa. And there you have it, a sample of the areas and attractions in Malta so you can pick and create your perfect Malta itinerary. Of course, there are lots of other things to do and see in Malta – we can’t cover them all. What do you think? Did we cover your favourite place or did we miss a town entirely? Let us know in the comments – we’d love to grow this post as more and more travellers adventure to the beautiful country of Malta! Looking back, this is the exact guide we wish we had years ago. Hopefully you find it valuable.